GAFFNEY, SC (courtesy limestone.edu) — The nearly 700-mile distance between Limestone College and the New York Stock Exchange will seem much shorter this fall. 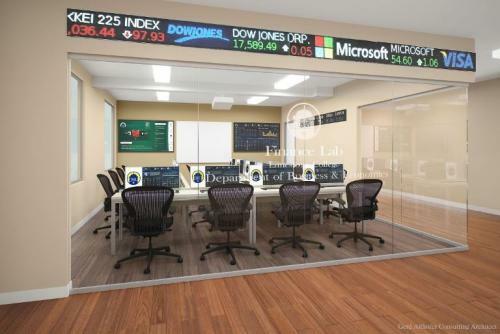 When they arrive on campus in August, Limestone’s Business and Economics students will not be ringing the opening bell on Wall Street, but they will be walking into the new Vera Jones Mitchell Finance Lab that will be located inside Montgomery Hall. The state-of-the-art, glass-encased facility will include technological tools such as 14 new financial analysis platform computer terminals, an electronic LED stock ticker, an interactive flat panel display, and more, all to enable students to monitor and analyze near real-time data from the financial market. Construction inside Montgomery Hall is expected to begin in the coming weeks and should be completed in time for the start of the 2018-2019 academic year. A lead investment has been made for the project by Vera and her husband, Sidney, and corporate and foundation partners are expected to be announced soon. Naming opportunities are available, and additional funding is still being sought for scholarships and for enhancements to the lab. Those interested are asked to contact Kelly Curtis, Vice President for Institutional Advancement, at (864) 488-4601 or by emailing kcurtis@limestone.edu. A current member of the Limestone Board of Trustees, Vera Jones Mitchell is a 1965 graduate of Limestone College. A former teacher, she resides with her husband in Greenville. Details on endowed scholarships planned in conjunction with the new finance lab will be announced in the near future, Parker added. The Accreditation Council for Business Schools and Programs (ACBSP) Baccalaureate/Graduate Degree Board of Commissioners awarded Limestone College accreditation of its Business programs last year. Of the current 746 ACBSP accredited schools, less than six percent have the type of finance lab that Limestone will open in the fall. Limestone’s Business program currently offers concentrations in Accounting, Economics, Finance, General Business, Legal, Management, and Marketing, as well as an MBA program with concentrations in Management & Leadership and Healthcare Administration.